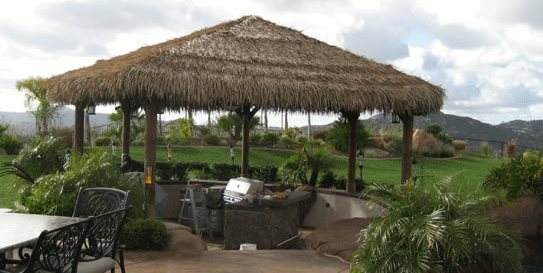 This palapa provides shade over an outdoor kitchen area with its Mexican raincape thatching. 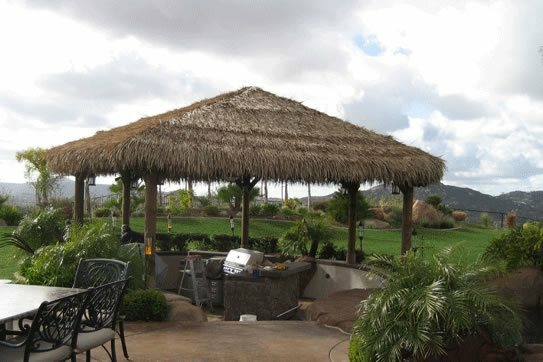 A large custom palapa can be a focal point in a landscape. 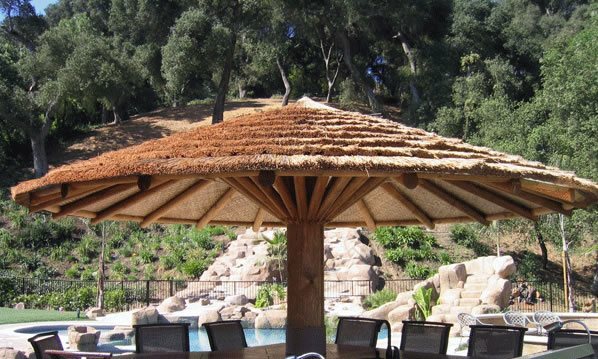 This umbrella palapa is made of South African reed thatching. 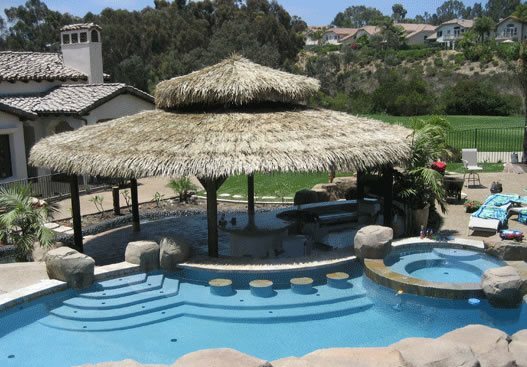 This large, custom built palapa contributes to the theme of this backyard retreat. 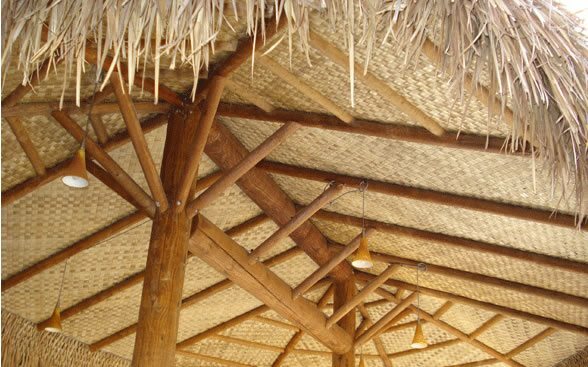 Underside of a palapa, built with grade “A” lumber and long lasting thatch. 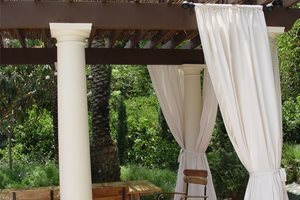 The simple 9’ or 12’ palapas are popular because they are inexpensive, easy to move around, and simple to install. Even smaller sizes palapas over a seating area can make a big statement. 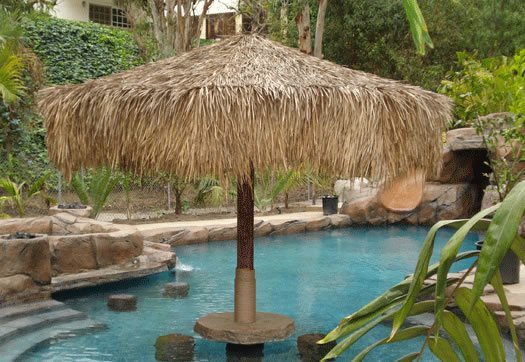 This oversized palapa umbrella provides the perfect poolside entertaining area. 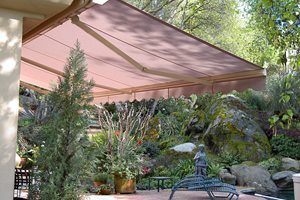 Palapas can be a powerful statement used in many ways throughout your yard. It’s no wonder why palapas are becoming more common in residential yards, their large poles and thatching may take you back to your last vacation. 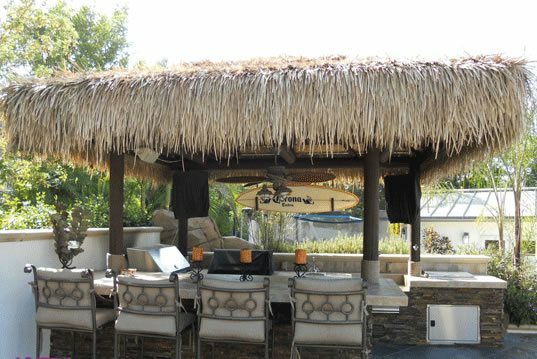 Memories or not, who wouldn’t like to relax under a palapa enjoying the atmosphere of a tropical paradise in their own backyard? Tropical landscaping can make your property feel like a private resort. 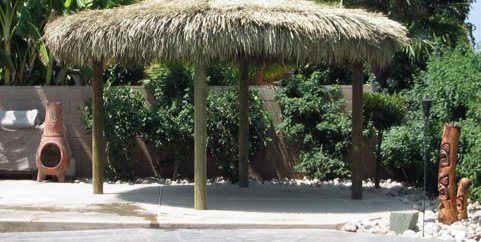 Palapa kits are available in shapes and sizes ranging from a single post 9’ diameter, to 6 post 16’ diameter. 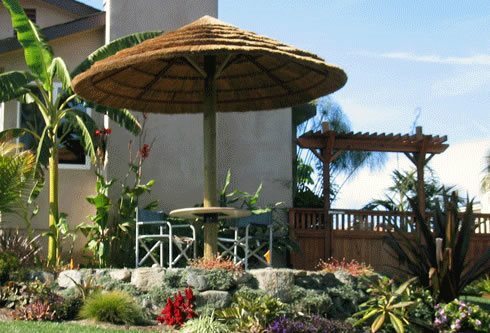 The most common palapas in residential yards are often the simple 9’ or 12’ diameter because they are simple to install and easy to move around. 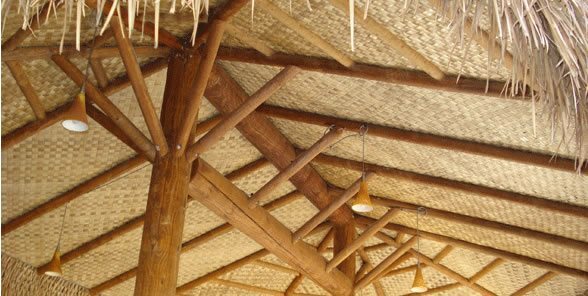 “Our kits are prefabbed with grade “A” lumber and shipped directly to the homeowner’s door,” explains Glenn Smith, Vice President of Palapa Kings Inc.
“Palapas are different from the norm. Most people have sat under one on vacation, drink in hand, relaxing,” explains Smith. This is now available to the average homeowner to install in their own back yard, taking them back to those enjoyable memories. 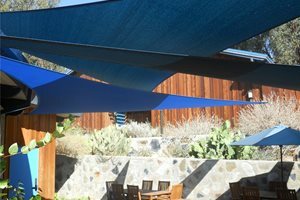 Palapas are maintenance friendly, “The frames are structurally engineered for 15+ years, all fastening hardware is galvanized and rust free,” says Smith. Beside a couple hose downs a year, palapas are maintenance free. 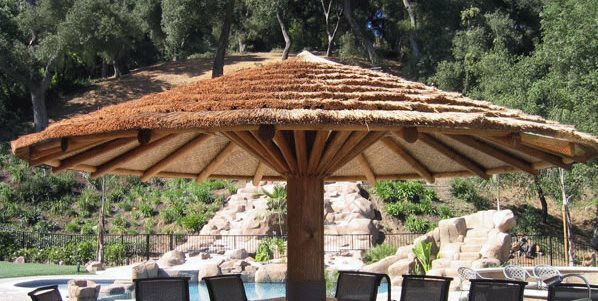 Depending on which type of thatch you chose and the climate you’re in, the thatch has a 4-10 year lifespan. 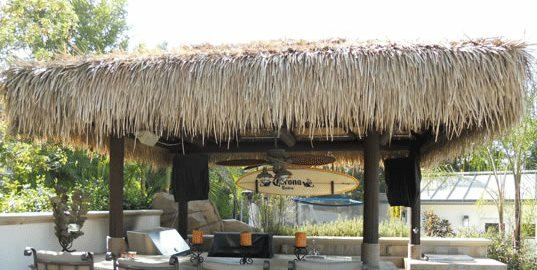 The thatch breathes thru the weave, which means it is durable even under heavy wind conditions that may reach up to 80 mph and is 95% waterproof under a heavy downpour. 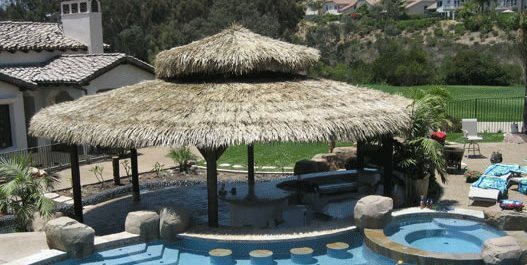 Replacement thatching is almost always available from the company from which you purchased your palapa. 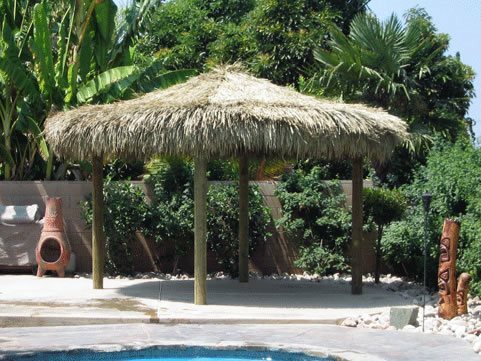 The average price of palapa kits from Palapa Kings range from $749.00 to $3,699 depending on the size and accessory options added such as: tables, custom stains, number of posts, and type of thatch. 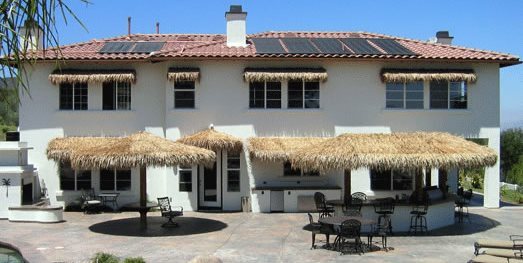 “Some of our custom projects in Southern California have ranged from $1,300 to $63,000 and up,” recalls Smith. What do homeowners like best about Palapas? 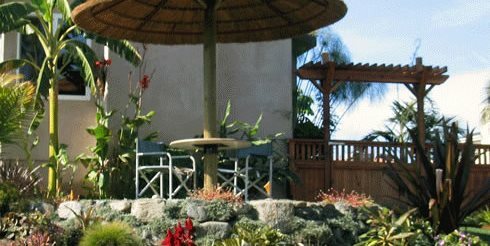 “The homeowners have a vision of creating their own tropical paradise in their backyard. Palapas contribute incomparably to making that vision an everyday reality, making them feel like they are on a permanent vacation. 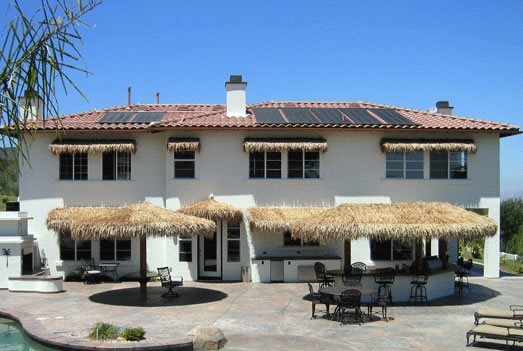 Over the past 14 years we have sold thousands of palapas to satisfied homeowners,” Smith says.